Christie’s New York auction in April totaled $35.2 million, with a rectangular, 22.03-carat, D, IF Van Cleef & Arpels diamond ring selling for $2.6 million. The June Magnificent Jewels auction in New York fetched $26.1 million, with Harry Winston buying the 18.04-carat Rockefeller Emerald ring for $5.5 million, or $305,516 per carat. The auction house generated $95 million at its May Geneva auction, with a heart-shaped, 92.15-carat, D-flawless diamond selling for $15 million, or $162,611 per carat. Christie’s headlined its November Geneva auction by selling the emerald-cut, 163-carat, D-flawless Art of de Grisogono, Creation 1 necklace for $33.7 million, or $206,266 per carat. The stone can also be worn as a bracelet (pictured). Total sales at the auction amounted to $106 million. Meanwhile, during the same month in Hong Kong, Christie’s garnered $94 million as an oval, 14.93-carat, fancy vivid pink, VVS1 diamond fetched $32 million, or $2.1 million per carat. Its December New York auction fetched $62.6 million, as a Graff ring with two pear-shaped, fancy vivid blue diamonds – 3.36 carat, VVS2 and 2.71 carat, VS1 – sold for $12.6 million, or $2.1 million per carat. Sotheby’s started the year with its April jewelry sale in New York fetching $28.9 million, with a pair of emerald, 20.29-carat and 20.02-carat, D, IF diamonds selling for $5.3 million, or $131,481 per carat. Its April auction in Hong Kong saw the sale of a 59.60-carat, fancy vivid pink, IF diamond to Chow Tai Fook for a record $71.2 million, or $1.2 million per carat. 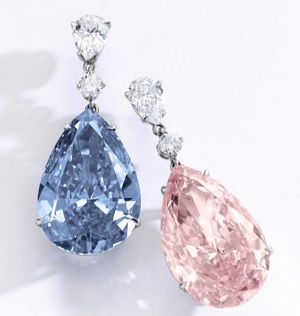 Sotheby’s Geneva auction, held in May, totaled $151.5 million, as a pear-shaped, 14.54-carat, fancy vivid blue, IF diamond fetched $42.1 million ($2.9 million per carat), and a matching pear, 16-carat, fancy intense pink, VVS2 diamond sold for $15.3 million ($959,636 per carat) (pictured). A cushion, 26.27-carat, I, VVS2 diamond bought in the 1980s for $13 sold at Sotheby’s London in June for $848,000. The auction house’s November Geneva sales garnered $79 million, with a 33.63-carat, fancy light pink, VVS1 diamond fetching $12.8 million, or $381,154 per carat. The 37.3-carat, cushion-shaped Raj Pink diamond failed to sell. Sotheby’s December jewelry auction in New York garnered $53.9 million, with the sale of an emerald-cut, 5.69-carat, fancy vivid blue, VVS diamond for $15.1 million, or $2.7 million per carat.